If you’ve been following my blog for a while then you probably already know just how in love I am with Mr Price. It offers a wide range of sizes, constantly adds the latest fashion to its stores on a daily basis and is super affordable! What’s not to love? 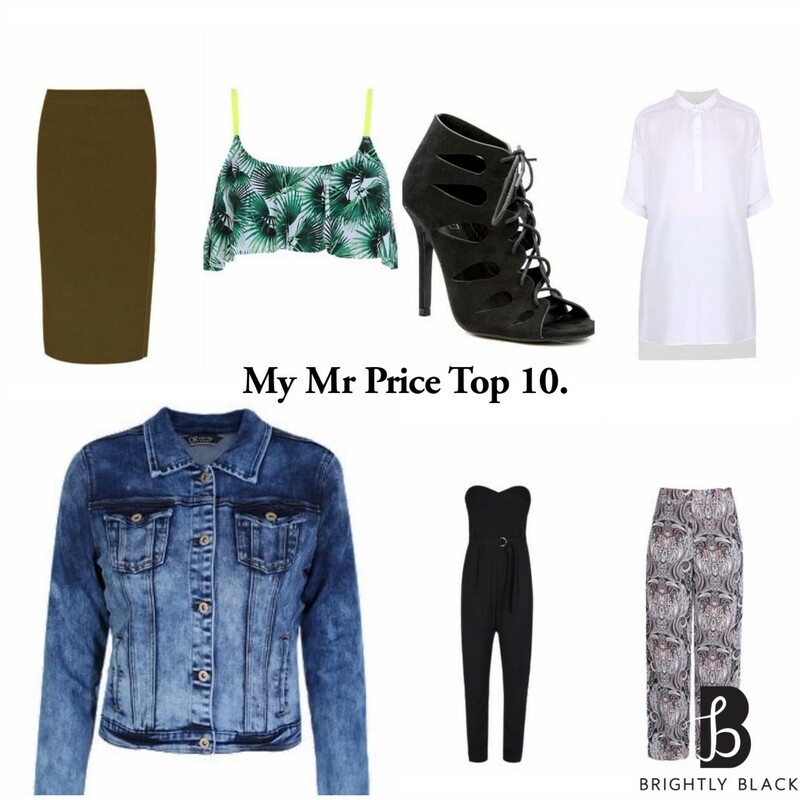 My Mr Price Top 10 list includes everything from shoes to bikinis, get ready! Let’s not even argue about this one. I’m not a bikini person and even I would totally rock this (or at least seriously consider it :). I not only love the pattern but the colour is amazing! I love the flirty top and the fact that it could help cover up some “problem areas” if you have any. The waviness of it all draws attention from areas you maybe wouldn’t want being stared at and draws attention upwards (to the eyes, of course). I will be the first to admit, I was absolutely terrified when I first noticed wide leg pants making a comeback (yes, I am dramatic like that), I just wasn’t ready. I know they say fashion evolves and “old looks” will eventually all make a comeback but I wasn’t expecting the return of the wide leg pants so early on in my life. That being said however, I am absolutely in love with wide leg pants at the moment. That seventies look is slowly creeping its way into tiny corners of everyone’s closet and I couldn’t be happier or more impressed. The wide leg pants are the most versatile of all other types of pants. They can be paired with anything from a crop top to a button up shirt and you’re good to go. I love the pattern on these pants and the material (100% viscose-woven) is flexible and extremely comfortable. I also like the fact that they have a slit on the side of them for those hot days when you just want your legs to pop out a bit for some fresh air. These pants are definitely a must-have. I have been a major fan of t-shirt dresses since I was in matric and couldn’t be happier that they have made a come-back (a huge one). They are one of the more comfortable items of clothing available for women out there and so if comfort is what you seek, well, you have found it. T-shirt dresses can be worn with anything from All Stars to one-strap heels depending on the time of day, occasion, or comfort level. I love how they can easily transition from day to night. They can take you to the beach in the afternoon and out to a chilled evening dinner with the girls afterwards. I love the stripes, the colour and the fabric of this particular dress and would recommend you go out there and grab yourself one because I see these running out fast. I expressed my undying love for sleeveless coats in a previous post and so this is an obvious one (or so I’d like to believe). There is something I find extremely classy about sleeveless coats and gilets that I haven’t ever really noticed with any other “cover-ups”. This gilet in particular is longer in length than the norm making it even classier. It can easily be paired with a pair of cigarette pants for that office look along with pointed stilettos et voila! For those considering summer jobs this holiday, consider this! A classic. This is yet another piece I refuse for us to fight over. The little black dress is timeless and requires the least amount of effort to dress up when planning a night out. Simply slip this on and add one or two accessories and you’re good to go. I not only love the stretchy fabric of this dress but the design as well. The ribs of the dress allow your skin to show without quite showing everything. I also love how the decolletage is covered up, cause if you’re going to be showing that much leg, you should definitely not be showing too much up top as well. You have to balance things out. It seems longer-length anything is in style these days. From the longer length gilet and now even the classic white button down has had a bit of a makeover. I have personally been trying to steer clear of anything with a collar lately after opening my wardrobe doors one day and realizing that one out of every three tops I owned had a collar. But this? I could not resist. Paired with a simple pair of leggings will give you that extra relaxed yet comfortably chic look, and a hat will be the icing on the cake. It is way easier to dress the shirt up than any other item I have mentioned thus far and should definitely be under consideration for any office-looks or for anytime where a casual feel is needed. Is there a single season in which the jumpsuit is out of fashion or inappropriate to wear? The answer is no! The jumpsuit is the Pharrel Williams of fashion. It will forever be trendy, versatile and will never age. I saw this particular jumpsuit as I was shopping around in Mr Price and the material is absolutely right for the shape and style of the jumpsuit. I love how the belt is sewn to the jumpsuit thus eliminating the stresses of having to mix and match to find a belt that perfectly matches with it. The jumpsuit is super easy to accessorize and play around with. Chunky platform shoes should be avoided though as the jumpsuit itself already commands attention. With a neckline like this minimal jewelry is needed to achieve the perfect, I-Woke-Up-Like-This Beyonce Look. No summer wardrobe is complete without a simple, blue denim jacket. Now I specifically say blue because blue gives more of a relaxed feeling to an outfit than any other colour does. And isn’t that what summer is all about? The denim jacket can be casually thrown over the above mentioned t-shirt dress for an extra relaxed look along with a pair of sneakers or all-stars. It can also be used to balance out the sophistication of the white collared button down or even the jumpsuit if need be. The blue denim jacket is the summer version of the leather jacket. It is a must have and will last you an extremely long time if cared for properly. First of all the fact that it is khaki alone makes this skirt a winner. I am absolutely in love with all things khaki or in that colour range and when I saw this I immediately thought, winner! This particular skirt is not too long, which is a major plus for someone of my height. Maxi-skirts are always too long and sweep the floor while short skirts are just plain uncomfortable. The midi bodycon skirt is a major win-win. I love the one sided slit it has as opposed to the two-sided slit that is usually in stores. I also love the breathable cotton and (surprisingly) the elasticated waist band. If you follow me on Instagram then you’ve most likely already seen these shoes in the pictures I’ve loaded and can probably sense my love for them from a mile away. I adore these! I had been seeing some of my favorite overseas fashionistas and bloggers rock them (with envy) for the longest time and had to grab them as soon as I saw them available at Mr Price. The lace-up strap has come into fashion with a major bang and I don’t see it’s presence fading anytime soon. This shoes is super comfortable and extremely versatile. The lace-up detail allows you to couple the shoes with a very simple outfit but make it still pop. And there you have it! 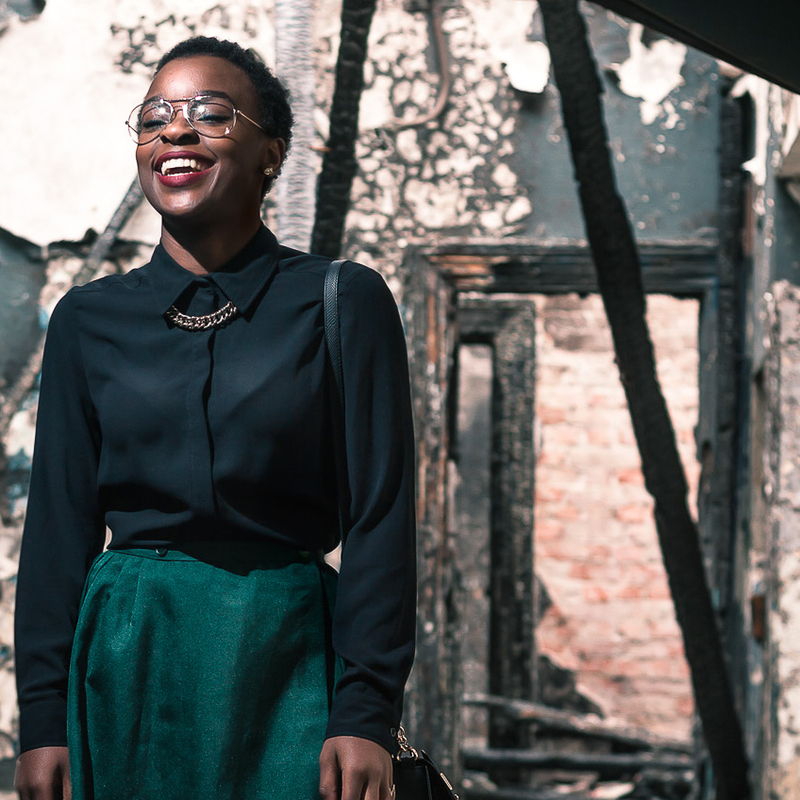 My top ten favorite items of clothing from the latest Mr Price catalog. If you’d like to shop these looks head on over to Mr Price or mrp.com if they haven’t already arrived in your nearest Mr Price store. Hurry, hurry, hurry while stocks last. What are your favourite Mr Price essentials right now?